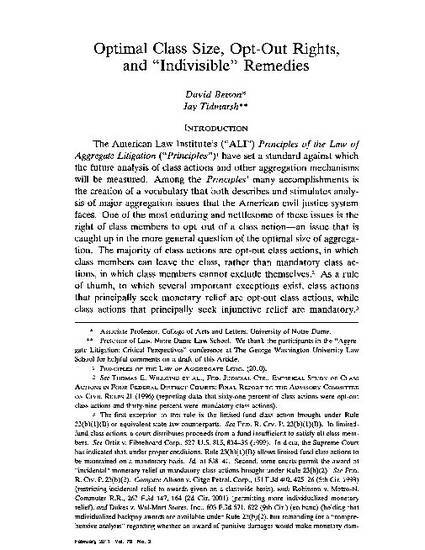 Prepared for a Symposium on the ALI’s Aggregate Litigation Project, this paper examines the ALI’s proposal to permit opt-out rights when remedies and “divisible,” but not to permit them when remedies are “indivisible.” Starting from the ground up, the paper employs economic analysis to determine what the optimal size of a class action should be. We demonstrate that, in some circumstances, the optimal size of a class is a class composed of all victims, while in other cases, the optimal size is smaller. We further argue that courts should consider optimal class size in determining whether to certify a class, and that there should be no opt-out right when a class is optimally sized. The ALI’s approach does not always lead to the most efficiently sized class actions. Reprinted with permission of George Washington Law Review.